Pesce d’aprile: What’s the Catch? Last week marked the Spring Equinox, bringing in warm weather and a lighter cuisine. This upcoming weekend, as we enter the new month, we start things off with April Fool’s Day! April Fool’s Day is celebrated around the world, with different cultural traditions. Did you know that in Italy, it is called Pesce d’april? In case you’re wondering – yes, the word pesce does refer to fish. And that’s no joke! 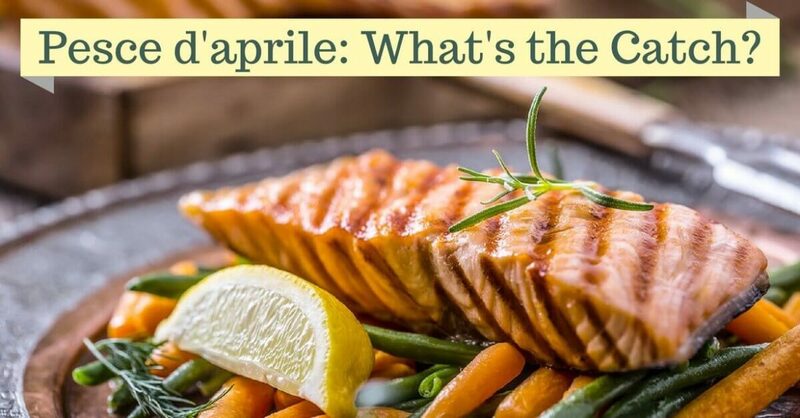 Let’s take a look at the history of jokes and tracks around the world and in Italy, and a fish-themed dishes to enjoy while celebrating Pesce d’april! Pranks, jokes, and tricks – this is the theme of April Fool’s Day around the world. If you’re on the receiving end of a joke, it may not be that fun for you! Is this what poet T.S. Eliot meant when he wrote the immortal lines, “April is the cruelest month”? Maybe not, but April Fool’s Day does have roots in literary history. In England, we find a trick (or perhaps misprint) in language to explain April Fool’s Day, located in Chaucer’s Canterbury Tales from 1392. In “The Nun’s Priest’s Tale,” the story is set “Syn March bigan thritty dayes and two,” which was understood to mean the 32nd day of March – or, April 1! Scholars believe that this was a printing error, but the wordplay remains. Back in the Middle Ages, New Year’s Day was celebrated on March 25 in many European towns, rather than our contemporary January 1. Back then, those who did celebrate on January 1 would make fun of people who celebrated in March. The date of April 1 is significant, as New Year’s would be celebrated as a weeklong holiday, from March 25 to April 1. None of this exactly explains the origin of “fish” in April Fool’s celebrations. In France, there is poisson d’avril; in Dutch, there is aprilvis; and of course, in Italy, there is Pesce d’aprile. Because of globalization, the “April fish” tradition has migrated to areas such as Canada as well. Where does the fish come in? In traditional celebrations, the jokester would try to attach a paper fish to the back of his target without being noticed. Later on, fish imagery began to appear in April Fool’s Day postcard from the 19th century. Additionally, when newspapers would run April Fool’s Day “stories” (which were, of course, false), there would be a fish clue in the story to let the reader in on the joke. Some historians trace the history of April Fool’s Day all the way back to ancient Rome, to a festival called Hilaria. This ancient Roman festival was celebrated on the March equinox (otherwise known as the first day of spring) to honor Cybele (mother of the gods). This festival took place on the day after the vernal equinox – the first day of the year in which day is longer than night. Throughout Italian history, there have been recorded tricks and pranks that took place on this day. One of the oldest and most famous in Italy is one from the 13th century: a man from Florence announced he would fly over the town of Bologna with a machine he invented. Everyone gathered to see the flight, only to realize they’d been fooled! Here at Cucina Toscana, we take our food seriously – but we love a good celebration! Come visit us on April Fool’s Day and treat yourself to some of our delectable fish dishes. For an appetizer, try the salmone carpaccio with fennel and arugula. To ring in spring, try the pesce al forno con porcini e piselli, fresh fish served with clams, shrimp, and peas. Or, for something a little zestier, try the pesce in umido, fresh fish with calamari, clams, shrimp, scallops and a spicy tomato sauce. We hope to see you at our table at Cucina Toscana – and that’s no joke!